This is guaranteed to convert almost anyone who hates brussel sprouts. Although you see otherwise in the picture, the standard method of preparing brussel sprouts includes trimming the stem by cutting it close up to the bottom of the sprout. I view this as more of an aesthetic issue, and prefer to leave the stem end intact. Bring a pot of lightly salted water to a boil; add brussel sprouts. Simmer sprouts for about 3 to 4 minutes, then drain. Plunge sprouts immediately into ice water; this will preserve the green color. *Alternately, you can simmer or steam the sprouts whole. If you elect this option, cook the sprouts until they’re tender enough to be sliced in half with a sharp knife, about 4 to 5 minutes. Drain the sprouts, then plunge into ice water. Drain again, then quarter each sprout. Meanwhile heat olive oil in a skillet. Add almonds and toast until almonds are golden brown, stirring frequently with a wooden spoon so that the almonds don’t burn. Remove from heat and set aside. Melt butter in a skillet over medium heat. You can use any type of unsalted butter. I prefer unsalted French butter such as beurre d’Isigny or beurre de Baratte for the taste and the higher butterfat content; Land O’ Lakes is a good American brand. Add brussel sprouts to the pan; taste for salt and pepper. 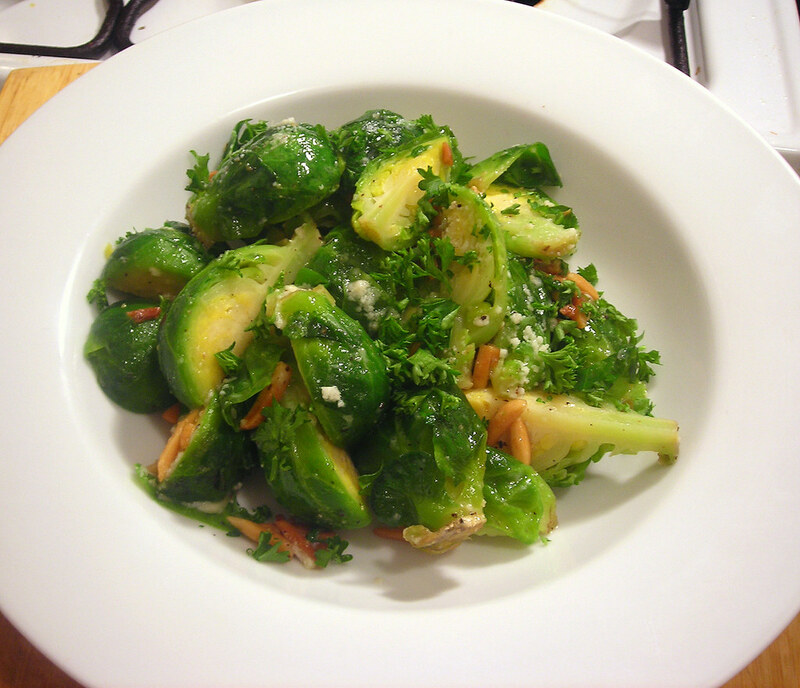 Cook sprouts, stirring occasionally, or until the sprouts become nicely glazed, about 1 to 2 minutes. Stir in almonds and parsley. Mix well, then sprinkle pecorino cheese. If you like, you can omit the cheese and substitute lemon juice and lemon zest instead. Taste for salt and pepper once more, then serve at once. This is my second submission for Weekend Herb Blogging #315, which will be hosted and organized by Haalo of Cook Almost Anything. Weekend Herb Blogging is a weekly foodblogging event that was originally begun by Kalyn of Kalyn’s Kitchen. 31 Dec	This entry was published on December 31, 2011 at 4:31 am. It’s filed under food, food photography, general, Weekend Herb Blogging, winter and tagged brussel sprouts, meatless, side dish, vegetarian. Bookmark the permalink. Follow any comments here with the RSS feed for this post. At Christmas, we used to have Scraped Sprouts every year. The recipe is to boil them in salted water for 20 minutes or so. Arrange them on a serving plate and place them on the table with the turkey, ham, roast potatoes, gravy, carrots, stuffing etc. Then let them go cold while the family eats everything else on the table. Bring them to the bin and scrape them in. Repeat annually until concluding that they are really an awful ‘mini cabbage’ and not fit for human consumption. The recipe is to boil them in salted water for 20 minutes or so. That’s why most people don’t like brussel sprouts — because of the tendency to overcook them which, essentially, turns them to mush. I’m one of those people who was a brussels sprouts convert once I learned how to cook them. This sounds delicious. Thanks Kalyn. Let me know how it turns out. I edited the post in the event someone decides to steam the sprouts whole before quartering them. I have to clarify my position on sprouts. I have cooked them properly in the past. I just don’t like them. I try very hard to keep an open mind about food but these guys just stick in my craw (not literally, not if you cut them up). The 20 minutes boiling was more from childhood memory than current practice. Oh, that’s quite all right. I hated vegetables when I was a kid — not to mention garlic and anything spicy. Well, look at me now! Heh. Lovely photography by the way. Rude of me not to comment. I love Brussel sprouts and this one will definitely find a seat at the table soon. Now if I could only get my photos to look as gorgeous as yours. Brussels sprouts and pecorino sounds like an intriguing pairing. I usually roast the spouts and add some parmigiano at the end, so I am eager to try pecorino instead. Lovely photo, indeed. hi Simona. I agree, parmigiano is usually my default; however, pecorino is what I had on hand at the time. it did work, although I’m not sure if it may work for you. let me know though, one way or another. I want to put in a good word for Brussels sprouts too. I learned how delicious they can be – first time, quartered and sauteed in sesame oil. Then covered and simmered in soy sauce and lemon juice til it carmelizes. Truly a treat. I’ve converted my whole family, parents included, to really appreciate Brussels. For those who need converting, try to buy on the stalk, they last much longer, and don’t buy the big overblown ones in the bin. Smaller ones taste better. Thanks for this great inspiring pic and fresh easy recipe. Will try it!